The first account of the Dolores Aguirre Bullrunning is three runners injured from contusion and one of them with any serious harm. The Dolores Aguirre bull-ranch usually sees some bulls separating from the pack and creating moments of danger. However, in this second running of the bulls of Sanfermin 2014, the bulls stayed together in a compact group over the whole course. One of the bulls slipped up at the Mercaderes corner and got a little left behind but without creating any danger. 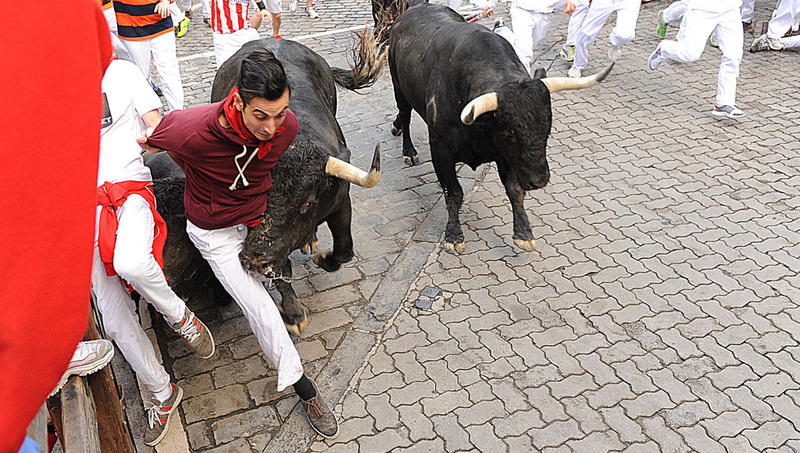 In Santo Domingo various runners tripped up and fell and they were stepped on by the passing bulls, without causing any serious injuries. The whole run was even cleaner than yesterday's with the Torrestrella bulls and it was quite a fast run, taking only two minutes 20 seconds. The 154th time that there were no gorings in a running of the bulls. The previous was on 07/11/2013. The 21st fastest running of the bulls. The 1st was on 07/13/2011. Dolores Aguirre is the 5th bull-ranch which have caused the most gorings (a total of 14). In 15 this was the 6th time that the Dolores Aguirre did not cause any gorings. The 6th fastest running of the bulls ever held on Tuesday.